How many times have you pulled the trash bag out of the can and carried it to the door, only to realize it's leaking junk all over the place because there's a tiny hole in the bottom? Holes are bad, and they let stuff leak out (or in). That's why these Chippewa Men ... (see full details) (see specifications) #CHP55171. How many times have you pulled the trash bag out of the can and carried it to the door, only to realize it's leaking junk all over the place because there's a tiny hole in the bottom? Holes are bad, and they let stuff leak out (or in). 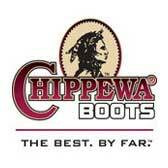 That's why these Chippewa Men's Brown 55171 Pull-On Wellington EH Boots don't have any holes. You don't need laces when you're working - just tough leather. The 10-inch uppers of these Chippewa boots are made with bay apache brown leather and no lace holes whatsoever. These pull-on boots are fashioned in a smooth Wellington style. No lace holes means no leaking. Of course, the leather itself is waterproof, so you're pretty safe against leaks as it is. Leather is pliable and soft even in bad weather. They have a material that moves comfortably around your feet with every single step. With waterproof and steam-sealed construction, you can be sure your feet will stay dry in this men's footwear. Step into this tall design anytime. The pull-on style of these brown boots is easy and comfortable to wear because you don't really need laces anyway. The inside of each of these Wellington boots is lined with moisture-wicking Dri Lex aerospacer material. The Dri Lex gently draws sweat away from your skin, so you stay drier, cooler, and more comfortable on the job. These waterproof boots are breathable to encourage air flow that keeps skin healthy. It also helps keep your feet at a comfortable temperature to help keep you going through your day. Soft Flexwelt insoles keep your steps cushioned from harsh stepping impact when wearing these men's boots. Made to breathe, the soft insoles prevent sweat, too. Covered with antimicrobial protection, the insoles of these EH boots defeat odor-causing bacteria before they can do their damage. No more smelly feet after a long day on the job. Black rubber outsoles on these safety toe boots create a durable, shock-resistant foundation for your steps. Rubber naturally absorbs impact to help you bounce back from steps while wearing these work boots. They're EH-rated to protect you from electrical hazards. The soles absorb electricity to keep you safer, even around open circuits. Chippewa Men's Brown 55171 Composite Toe Pull-On Waterproof Boots don't leak, and that's just the beginning of what this Chippewa footwear will actually do for you. If you want to give them a try, trust in Chippewa quality to help get you through your longest work days. Ordered for my tech in the filed and he liked them very much, comfortable fit, good wearing, fits the needs of our customer requirements. Nice looking boot and cleans well. Would buy again in the future. Have added boot to our personal catalog for future orders from other technicians in the field. Great boots. Mine are a little larger than most boots, such as Double H or Justin. There are very warm, but they don't breath all that well. With a thick pair of socks and a larger insole, you will be able to slog through the snow! Boots arrived on time and were very comfortable. I did not need to do much to get them broke in. Boots were needed to be delivered in a window of when I was gong to be on site and these did. They were everything I expected them to be and I will order these boots again at a later date. Thank you very much for a fine product. Very sturdy and comfortable and worth every penny. I am on my feet a lot and I have never been disappointed or hurting at the end of the day. In the construction industry we will always come back to the boot that performs and never leaves us sitting down on the job. Thank you for your customer service also! Chippewa Boots: Men's Brown Waterproof 55171 Brown EH Pull-On Wellington Work Boots is being added to your cart.